Little, Brown and Company, 9780316432344, 256pp. The acres and acres of fertile soil, the two-hundred-year-old antebellum house, all gone. And so is the woman who gave it to Jack, the foster mother only days away from dying, her mind eroded by dementia, the family legacy she entrusted to Jack now owned by banks and strangers. And Jack's mind has begun to fail, too. The decades of bare-knuckle fighting are now taking their toll, as concussion after concussion forces him to carry around a stash of illegal painkillers and a notebook of names that separates friend from foe. But in a single twisted night, Jack loses his chance to win it all back. Hijacked by a sleazy gambler out to settle a score, Jack is robbed of the money that will clear his debt with Big Momma Sweet--the queen of Delta vice, whose deep backwoods playground offers sin to all those willing to pay--and open a path that could lead him back home. Yet this sudden reversal of fortunes introduces an unlikely savior in the form of a sultry, tattooed carnival worker. Guided by what she calls her "church of coincidence," Annette pushes Jack toward redemption, only to discover that the world of Big Momma Sweet is filled with savage danger. Damaged by regret, crippled by twenty-five years of fists and elbows, heartbroken by his own betrayals, Jack is forced to step into the fighting pit one last time, the stakes nothing less than life or death. 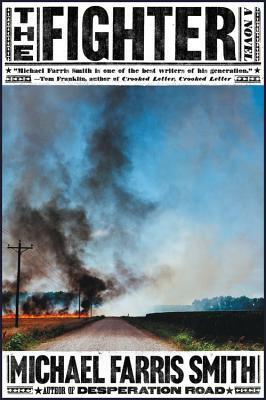 With the raw power and poetry of a young Larry Brown and the mysticism of Cormac McCarthy, Michael Farris Smith cements his place as one of the finest writers in the American literary landscape. Michael Farris Smith is the author of Desperation Road, Rivers and The Hands of Strangers and is the recipient of the 2014 Mississippi Author Award. His short fiction has twice been nominated for a Pushcart Prize, and his essays have appeared in the New York Times, Catfish Alley, Deep South Magazine, and more. He lives in Oxford, Mississippi, with his wife and two daughters. "I loved The Fighter. Michael Farris Smith is one of the most exciting new voices in American fiction. Just as I couldn't put down Desperation Road till I finished, I tore through this novel as well. I'm hooked." "The Fighter is a beautifully written parable of a man, abandoned as a child, at war with himself. Hiding behind the expertly-handled plot and poetic meditations on violence and substance abuse is the notion that lack of family can send you on a continuous tumble through darkness. With its tension-filled and enlightening final chapters, The Fighter delivers a powerful and engaging read from one of our newest and finest writers."